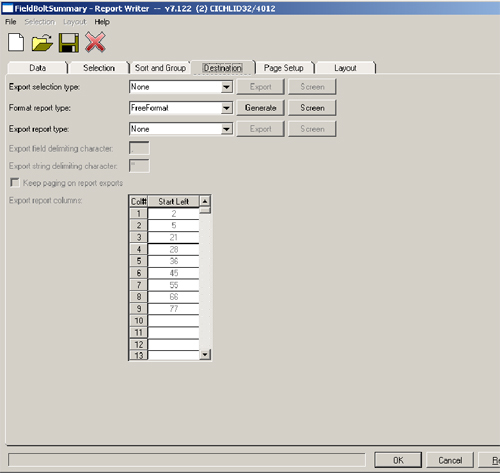 SDS/2 Report Writer formatted reports can be exported to delimited files for import into spreadsheets, databases or other applications. On the Destination tab, change the Export report type to Delimited. If you plan on using Run Report Writer Report, change Format report type to None. Set the output file name by pressing the output configuration button (“Screen”). Change Send output to to Disk and enter or browse for the file name. The delimited output may also be saved from the Output Request Summary screen. Make sure the Export report columns have been set. These have been preset in versions since 7.116. Select Report_Header section on the Layout tab. Change TRUE to FALSE in the Action before command set( use_boxing, TRUE ). This removes underlines and vertical lines creating the report grid. If you want to save these changes to be run more than once, save the report as a different name. Note: Some spreadsheets import files with the “csv” extension without allowing the user to specify settings for the import. 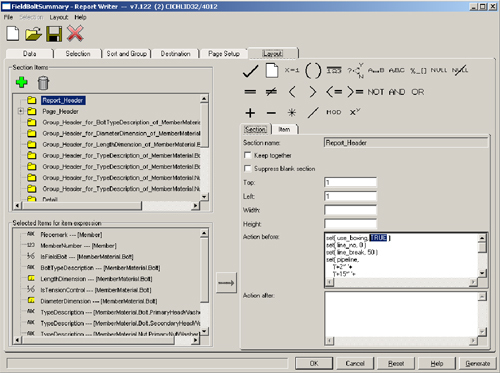 They determine column type based on the data being imported. Fractions frequently are interpreted as date values (i.e., 3/8 as the date March 8). The spreadsheets we have tested do allow column type definitions for delimited files with a “txt” extension. SDS/2 dimension strings are the most common fields to be misinterpreted.